An Ibiza boat party is a fantastic way to get out make the most of your day and to witness the true beauty Ibiza has to offer. The boat party departs from Borra Borra beach Playa Den Bossa, meaning not only do you get to take in the views of Formentera and surrounding scenery. You also will have the chance to enjoy a beach day, pool party and atmosphere that Playa den Bossa has to offer. In regards to budgeting throughout your Ibiza getaway, investing into a boat trip such as this can be surprisingly worth the money when compared to what could otherwise be spent on just a couple of drinks in Playa den bossa, a meal or water sports and provides a care free all inclusive experience for fantastic value. Yes, that's right... 4hrs of unlimited drinking! Anything from spirit mixers, mojitos, wine, beer, sangria to many more cocktails are all inclusive and unlimited throughout your trip! Whats an Ibiza getaway without experiencing fresh Paella? A great attribute of added value to this package is the fresh fruit canapes and paella provided on board!... The total cost of this trip is similar to that what would otherwise be spent in at a local restaurant on a paella dish and drinks near the beachfront. Jet ski rides and banana boat rides at no extra cost! 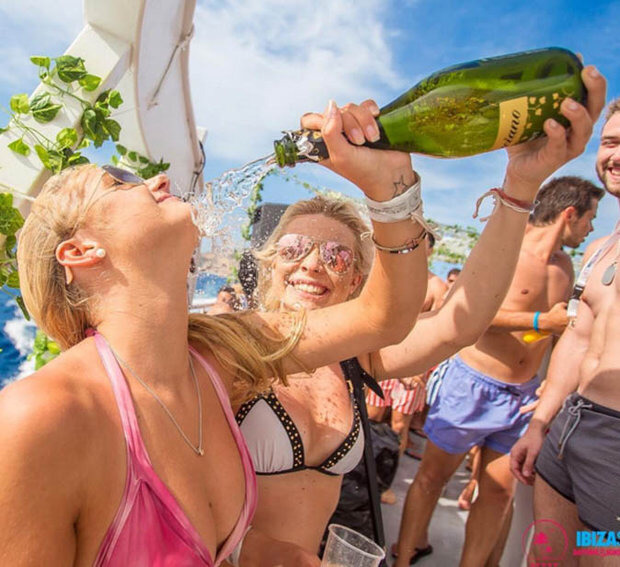 Include your Ibiza boat party as part of a bespoke itinerary to make the most of your time and guarantee the best prices! - Shots to finish the meal and get the night started! - We organize everything for you!